We love Tuli Wilderness, Botswana - for its vast open spaces, rough and rocky terrain, barren and beautiful landscapes and the unexpected treasures to be found there... It was the venue for our Bush Skills course last year and we were delighted to have the opportunity to return for 4 nights in early July. 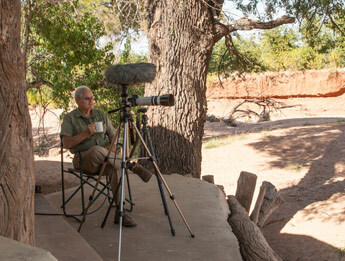 Our main objective was sound recording - particularly large mammals, but also baboon vocalisations for a new project we are busy with. We opted for two nights at Serolo Tented Camp situated close to the Limpopo River and surrounded by great riverine vegetation (and plenty of baboon activity), and then two nights at the rustic Mohave Bush Lodge. The big attraction at Mohave, in addition to its remoteness, was the array of animals that wandered in and around the camp each evening. 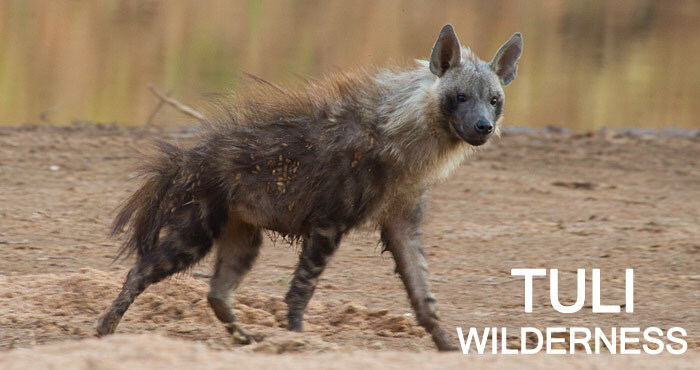 The highlight of the trip was an, unexpected but always hoped for, superb sighting of a young Brown Hyaena that strolled up the almost dry Limpopo riverbed, stopping a short distance from us with great opportunities for several photographs, and then turning away to disappear into the bush on the bank behind us. All of this whilst we were watching the activities of a breeding colony of White-fronted Bee-eaters in the tall riverbank, with several Horus Swifts making use of a few abandoned holes for their nests. Surprisingly the Impala were still rutting and called continuously through the night. A Kudu provided a great series of loud alarm calls on the first evening – but we couldn't pick any sound of a predator in the headphones, and shortly afterwards the local baboon troop joined in the alarm chorus. In between a Verreaux’s Eagle Owl gave its loud grunting call at regular intervals. 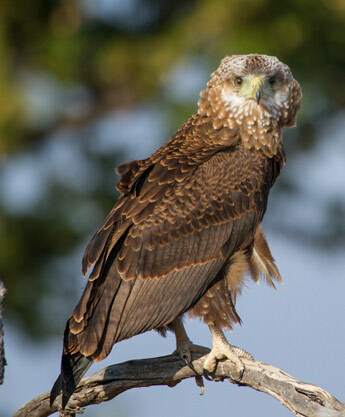 On our morning drive the next day we virtually ‘bumped’ into an immature Bateleur that sat quietly for a few minutes only a few metres away before flying off. The area is dove paradise with thousands of Cape Turtle Doves everywhere, bursting out of every bush as we drove slowly past. African Green Pigeons made good use of a sunny spot in a large tree near the camp in the early morning. Mohave was exceptional – just the two of us - no electricity, no internet, and little other noise apart from the sounds of the bush. Accommodation is in simple pole and thatch huts, with a comfortable thatched lounge/dining area and a great braai (barbeque) area. There was plenty of elephant movement in the area with one bull coming down to drink at the small waterpoint on the edge of camp on day 1. 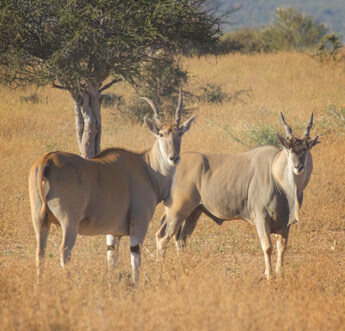 Other large mammals included Eland, Zebra and Blue Wildebeest. The dominant bird species was the metallic Meves’s Starling and surprisingly a single Tropical Boubou. A Crimson-breasted Bush Shrike gave us several photo opportunities on the morning drives, and during the heat of the day we were able to photograph a good variety of colourful butterflies including several new species for our list. Then the camp came alive at night! 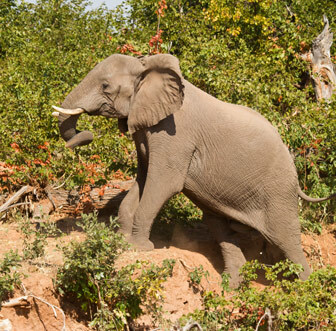 Just after going to bed on the first night the elephants arrived, feeding on the mopane woodland surrounding the camp, with some coming right next to our hut. The microphone was placed strategically just outside the hut with the recorder right next to the bed. At one stage the resident lion pride roared quite loudly in between the elephant noises but unfortunately they did not visit the camp. The next night a female leopard in oestrus called over and over right next to the camp and eventually a suitor responded from some distance away. 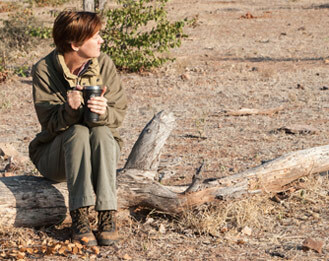 She then moved off and a Black-backed Jackal gave a combination of yowls and growls in displeasure at her presence. Impala, Zebra and Blue Wildebeest made up the rest of the evening chorus before we happily fell asleep. Now we look forward to a planned return later in the year. This late night sound clip starts off with a Pearl-spotted Owlet, followed by a Kudu alarm bark and the baboon troop from the first evening and finally ends with the leopard call from the last night.